[03:07] > +Vanadine (Nightgown) drinks a little more. [03:12] [+Vanadine (Nightgown)] Yes well... I was exhausted by the time I even made it to that fourth stage. Then my mind became clouded and I couldn't clear my mind enough to finish. [03:12] [@Nate Detroit] I imagine.. They don't make it easy. [03:14] > @Nate Detroit continues to smile and sips his drink. [03:15] [+Vanadine (Nightgown)] So, how's kitty-chan? [03:16] [@Nate Detroit] Pregnant and affectionate. Gets grumpy sometimes but she's well. [03:18] [@Nate Detroit] We all missed you. Care to explain why you had to leave? [03:19] [+Vanadine (Nightgown)] Well.... it was this sudden rash of pregnancies..... It made me feel very.... inadaquite. [03:19] > @Nate Detroit puts his hand around Vana's arm. [03:20] [@Nate Detroit] I don't suppose theres much point explaining why that isn't true? [03:22] > @Nate Detroit sighs. [03:23] [@Nate Detroit] I see..
[03:23] [+Vanadine (Nightgown)] ..... I just didn't want to put you guys through it. So I had to get away..... to clear it out of my mind. [03:24] [@Nate Detroit] Well, we missed you a great deal, and I'm sorry you felt you had to run away. [03:26] [+Vanadine (Nightgown)] Yeah.... well...... I learned alot while I was gone..... I won't be doing that again. [03:26] > @Nate Detroit lifts her chin and looks at her, face to face. [03:27] > @Nate Detroit gives her a soft kiss. [03:30] > @Nate Detroit breaks it and looks into her eyes. [03:32] > @Nate Detroit puts down his glass, stretches his arms, then lifts her with a grunt. [18:56] > ~An odd girl wearing a hooded grey raincloak begins to wander through the ship. [19:00] > ~The odd girl contines to slowly and carefully search the ship. [19:18] [~The odd girl] Hmmm, where's all the people? [20:12] [~The odd girl] Helloooooo~! [20:14] [~The odd girl] I'll be back! [22:41] [@HOL_6000] Welcome aboard, Daniel J. [00:07] [Minako Kaioh (PJs)] Good evening Haruka-san. [00:07] > Minako Kaioh (PJs) sits down somewhat carefully on the couch. [00:07] [Haruka Tenou] what's up with you? [00:09] [Haruka Tenou] can't sleep? [00:10] [Minako Kaioh (PJs)] Mmm... not really. I'm glad an enemy of peace, justice and love is gone from this world. [00:11] [Minako Kaioh (PJs)] You still think I'm a kid, Haruka-san? [00:13] [Minako Kaioh (PJs)] Aww... wanna talk about them? [00:15] > Minako Kaioh (PJs) nods. [00:17] [Minako Kaioh (PJs)] Those were rough times.. Rei-chan having nasty visions and not telling us.. you guys showing up, taking pure hearts and refusing Usagi's requests for teamwork..
[00:19] [Minako Kaioh (PJs)] I like to think I can trust you all.. but she makes it difficult. [00:20] [Minako Kaioh (PJs)] And I think its that stance that keeps tension between us. [00:21] [Minako Kaioh (PJs)] Huh? What do you mean? [00:22] [Minako Kaioh (PJs)] Glory? What glory? You mean when we made the barrier to contain all the diamons and got tore up before we got exploded? Or maybe when we got killed by Galaxia before we could even do anything? [00:25] [Minako Kaioh (PJs)] Theres very little glory in our work. We're urban legends. We've protected Usagi from a lot of things over the years at great personal cost.. and the closest we have to glory is a strong friendship... but if you say you're working 'behind the scenes' I believe you. [00:25] [Haruka Tenou] we would die for the princess just as much as you would. [00:26] > Minako Kaioh (PJs) frowns at that and puts a hand on her stomach. [00:26] [Minako Kaioh (PJs)] I.. I know.. I know you have. [00:27] [Minako Kaioh (PJs)] Barely, unless you count Aino Minako. [00:28] [Minako Kaioh (PJs)] Why, you want to be famous? [00:28] [Haruka Tenou] but I suppose being known isn't everything in life of course. [00:29] [Haruka Tenou] nah..I already am anyway. [00:30] [Haruka Tenou] hm? about what? [00:31] [Minako Kaioh (PJs)] My baby, and this war. Something... happening..
[00:32] [Haruka Tenou] like a miscarrage? [00:33] > Minako Kaioh (PJs) curls her lip and glares at Haruka. [00:36] [Minako Kaioh (PJs)] How many times have we all died? Did one of us 'let' that happen? [00:37] [Minako Kaioh (PJs)] Thats... nice of you to say that you would protect me, Haruka-san. ~_~ But things get out of our control..
[00:38] [Haruka Tenou] can I be blunt with you, minako? [00:41] [Minako Kaioh (PJs)] I'm glad. ~_~ I'm still mad that she slapped me for helping her get pregnant after ASKING for my help. [00:44] [Minako Kaioh (PJs)] Heee~ Okay. *^_^* Ne ne, maybe after this is over you two should adopt. That might help if you still have ENS. [00:45] [Minako Kaioh (PJs)] Okay, night Haruka-san. [00:46] [Minako Kaioh (PJs)] Hmm... I never know what to make of her..
[00:48] > Minako Kaioh (PJs) lays down, proping her feet on the arm rest and looking at the ceiling. [01:01] > Minako Kaioh (PJs) closes her eyes, and after a moment, starts to snore. [01:03] > Nephrite Masato (Workout) walks in and grins, "Well well, it's sleeping beauty." [01:06] > Minako Kaioh (PJs) smiles and giggles, opening her eyes after a moment. [01:06] [Minako Kaioh (PJs)] Konbon wa, manager-san. [01:08] > Minako Kaioh (PJs) giggles again. [01:08] [Minako Kaioh (PJs)] Don't get enough sugar at home? [01:12] [Nephrite Masato (Workout)] Just wanted to wake the princess. ^_~ I get plenty of sugar at home between my two girls. [01:13] [Minako Kaioh (PJs)] Hee.. well, I don't think my husband will mind a few kisses in moderation, so use your best judgment. ~.^ Whats new? [01:14] [Nephrite Masato (Workout)] Not a whole lot. How'd you like that voice work you did a few weeks ago? [01:15] [Minako Kaioh (PJs)] It was fun! Really gave me a chance to do something fresh. [01:19] [Nephrite Masato (Workout)] How would you like to do it again? [01:23] > Minako Kaioh (PJs) sits up carefully. [01:23] [Minako Kaioh (PJs)] What do they sell? [01:32] [Minako Kaioh (PJs)] *^_^* Hee.. well, when you put it that way..
[01:34] [Nephrite Masato (Workout)] I'll call the company in the morning and say you'll do it then. [01:35] [Minako Kaioh (PJs)] Please do. [01:35] [Minako Kaioh (PJs)] Sit with me? [01:36] > Nephrite Masato (Workout) nods and sits next to Mina. [01:37] [Minako Kaioh (PJs)] Nani? [01:37] > Minako Kaioh (PJs) blinks, then closes her eyes and returns it with a quiet moan. [01:38] > Nephrite Masato (Workout) slowly breaks the kiss with a smile, "Naftis did give me a pass when it comes to you." [01:39] [Minako Kaioh (PJs)] Oh really? *^_^* And how far does this 'pass' extend? [01:39] > Minako Kaioh (PJs) puts her leg over Nephrite's. [01:39] [Nephrite Masato (Workout)] Well... I think we can flirt a little... as long as it doesn't go TOO far. [01:40] > Nephrite Masato (Workout) lightly rubs Mina's leg, smiling to her. [01:45] [Nephrite Masato (Workout)] Yes well.... I've been trying to tame my ways a little bit lately. [01:46] [Minako Kaioh (PJs)] I can tell Naftis-san really cares about you. [01:46] [Nephrite Masato (Workout)] She does and so does Hotaru..... they're both very sweet and they'd do anything for me. [01:47] [Nephrite Masato (Workout)] They took the entire day off the other day for me when I was feeling really down about a lot of things. [01:51] > Minako Kaioh (PJs) leans against Neph and sighs. [01:51] [Nephrite Masato (Workout)] I felt bad being so selfish with their time... but I really needed some reassurance about a few things. [01:52] [Minako Kaioh (PJs)] I guess you have to make time for love sometimes, even in war. [01:58] [Nephrite Masato (Workout)] I really wish there were something I could do to help you girls with this..... but I can't think of what. [01:58] [Minako Kaioh (PJs)] Your moral support is a start.. and keeping me organized is good. [02:00] [Nephrite Masato (Workout)] I will do my best with that. [02:08] [Nephrite Masato (Workout)] Have I ever told you you're super cute when you blush like that? [02:09] [Minako Kaioh (PJs)] *^___^* I thhik you haa-veee..
[02:10] [Nephrite Masato (Workout)] Well, I definitely ment it, because it's completely true. [02:11] > Minako Kaioh (PJs) withdraws her leg and squirms in embarrassment. [02:12] > Minako Kaioh (PJs) gives a light squeak and nuzzles her back against him. [02:12] [Minako Kaioh (PJs)] Even expecting? [02:13] [Nephrite Masato (Workout)] Oh of course. [02:14] > Nephrite Masato (Workout) lightly tickles her side and grins, "But you like it dirty, don't ya'? [02:15] > Minako Kaioh (PJs) giggles and squirms. [02:19] [Nephrite Masato (Workout)] How's Kato in that department, pretell? [02:21] [Minako Kaioh (PJs)] Not -too- shabby. Doesn't get rough often, and less so these days, understandably. How about Naftis? [02:26] [Minako Kaioh (PJs)] Well, don't be too shy with her. Lots of women like to be conquered, especially the ones who are already so powerful, like her. [02:34] > Minako Kaioh (PJs) gives a pronounced yawn. [02:35] [Nephrite Masato (Workout)] Well, that means you're either bored by me or you're tired. [02:40] [Minako Kaioh (PJs)] Tired, at the least. ~_~ Carry a lady and her child to bed? [02:43] [Minako Kaioh (PJs)] Or at least their home..
[02:43] > Minako Kaioh (PJs) holds on to him, leaving her eyes closed. [21:05] [+David O'Cain (casual)] Oh. Hey, Setsuna. [21:08] [@HOL_6000] Welcome aboard, Daniel J. [21:09] [+David O'Cain (casual)] How're you? [21:09] [+David O'Cain (casual)] That's good to hear. Been up to much as of late? [21:11] [+David O'Cain (casual)] Like what if I may ask? [21:13] [+David O'Cain (casual)] Oh really? When'd you get hitched? [21:14] [Daniel J.] It sounds like congratulations are in order. [21:15] [+David O'Cain (casual)] Congratulations. Still would be nice to know earlier so that your friends could attend. [21:18] [Daniel J.] Many wishes for a happy future, Miss Meioh. [21:18] [Daniel J.] Or are you changing your name? [21:21] [+David O'Cain (casual)] Hmm. Never heard of the husband taking the wife's last name. Must be a rare occurance. [21:25] [Daniel J.] I suppose it must be rarer here. [21:30] [+David O'Cain (casual)] How're you liking the married life so far, Setsuna? [21:36] [+David O'Cain (casual)] That's good. [21:42] [Setsuna Meioh (casual)] hm?? [21:47] [Daniel J.] I don't suppose you can help? [21:50] [Daniel J.] That would depend what you want, naturally. [21:51] [Daniel J.] M-meet them? I don't think I'm allowed. [21:56] [+David O'Cain (casual)] I need to get going. Nice seeing you again, Setsuna. [21:56] [Daniel J.] Night, Dave. [21:57] [Daniel J.] I...I'll have to think about it. [22:10] [Daniel J.] Think I'll get going..
[22:58] [@HOL_6000] Kaede Sasaki (Casual) reporting for duty. [23:02] [Kaede Sasaki (Casual)] Not bad. Just finished cleaning up the kitchen. Waiting for Kalli-chan to finish up her shift. [23:03] > Setsuna Meioh (casual) nods "that's good"
[23:04] [Kaede Sasaki (Casual)] What are you drawing? [23:07] [Kaede Sasaki (Casual)] Oh that's...... wait.... did you say HUSBAND!? [23:10] [Kaede Sasaki (Casual)] When'd you get married and why didn't you tell me!? I would've loved to have been there. [23:12] [Kaede Sasaki (Casual)] I see, who was there? [23:15] [Kaede Sasaki (Casual)] Wow.... that's very.. minimal. [23:17] [Kaede Sasaki (Casual)] Oh yeah? Can I see? [23:24] [Kaede Sasaki (Casual)] Akira's quite the handsome man... you make a very cute couple. [23:24] > Setsuna Meioh (casual) nods "he has taken my name in the marriage"
[23:25] [Kaede Sasaki (Casual)] That's rather unusual, but very sweet of him. [23:35] > Kaede Sasaki (Casual) hands Setsuna the pictures back | I bet. [23:41] [Kaede Sasaki (Casual)] Well, I'll be honest.... my feelings are a little hurt myself. [23:55] [Kaede Sasaki (Casual)] Thank you. [00:00] > Kaede Sasaki (Casual) sips her tea| Alright then Setsuna-san. [00:02] [Kaede Sasaki (Casual)] I will. Goodnight. [00:24] [@HOL_6000] +Kalli (Jumpsuit) reporting for duty. [00:24] > +Kalli (Jumpsuit) walks in, stretching a bit. [00:26] > Kaede Sasaki (Casual) giggles | Care to have some of my tea? [00:26] [+Kalli (Jumpsuit)] Sure, I could use a warm drink right about now. [00:27] > +Kalli (Jumpsuit) heads over and plops down next to Kaede. [00:30] > +Kalli (Jumpsuit) leans a little against Kaede and sips the tea. [00:32] [Kaede Sasaki (Casual)] How's my Kalli-chan? [00:33] [+Kalli (Jumpsuit)] Holding up, work is a little tougher with Rowe-san on light duty. [00:35] [+Kalli (Jumpsuit)] We're managing, though. [00:45] [Kaede Sasaki (Casual)] You must have been working hard today.... you're all tensed up. [00:47] [+Kalli (Jumpsuit)] I know. >_< Glad you have magic hands, I'm feeling better already. [00:50] [@Nate Detroit (PJs)] Evening, ladies. [00:51] > @Nate Detroit (PJs) goes to the bar and gets a drink and a bag of chips. [00:51] [+Kalli (Jumpsuit)] Heya, Nate-kun. How's your uh.. condition? [00:52] [@Nate Detroit (PJs)] ~_~ You heard about that, huh? [00:53] [@Nate Detroit (PJs)] I did? Ohh.. sorry, when someone gets into your head and extracts another person, I guess it makes you forget some things. Yeah, I'm cured. [00:55] [Kaede Sasaki (Casual)] Oh really? [00:55] [+Kalli (Jumpsuit)] That's good. [00:55] [@Nate Detroit (PJs)] Ms. Katheti saw to that. I'll have to send her something nice. [00:56] [+Kalli (Jumpsuit)] I don't think I've met her yet. [00:57] [Kaede Sasaki (Casual)] Naftis-san helped you by extracting the other personality like she did with Hotaru-san? [00:58] [@Nate Detroit (PJs)] Apparently. I don't know anything about that. [00:59] [Kaede Sasaki (Casual)] Intersting.... so does that mean she'll be running around here soon? [00:59] > Kaede Sasaki (Casual) giggles | I remember Natalie-chan... don't you Kalli-chan? [01:06] [@Nate Detroit (PJs)] I guess I still am. 9_9 though now I'm less inclined to do some things. [01:06] > @Nate Detroit (PJs) sits with them. [01:08] > @Nate Detroit (PJs) gives another sigh at her touch. [01:09] > +Kalli (Jumpsuit) stands and sits back down on his lap. [01:09] [@Nate Detroit (PJs)] You two are too kind. [01:10] > @Nate Detroit (PJs) holds Kaede and closes his eyes. [01:15] > @Nate Detroit (PJs) sighs again, smiling. [01:15] [@Nate Detroit (PJs)] Maybe someday I'll understand why women flock to me to give me comfort. [01:17] [Kaede Sasaki (Casual)] There's something about Nate-kun that is just.... a natural attration. [01:21] [+Kalli (Jumpsuit)] Yeah, it's tough to explain, it's just there. [01:21] [@Nate Detroit (PJs)] I hope I'm not a third wheel here. [01:24] [@Nate Detroit (PJs)] Hope we can count on you girls to babysit from time to time. [01:26] [@Nate Detroit (PJs)] Heh.. whats happening between you two? Any thoughts to a civil union or something? Adopting? [01:28] [+Kalli (Jumpsuit)] We've been planning on getting married for a while. I proposed to Kaede already. [01:29] [@Nate Detroit (PJs)] I thought so, but you hadn't said anything for so long. [01:34] [+Kalli (Jumpsuit)] There's a few places in Canada I've been eyeballing, though. Holly shouldn't have any trouble whipping up some fake citizenship data for us. [01:35] [@Nate Detroit (PJs)] That's nice. I haven't been to Canada in a while. Had some nice vacations there as a kid. [01:37] [@Nate Detroit (PJs)] Skydome was amazing. I went drinking there not long after I turned 19. Wish I had saw Phantom when I had the chance..
[01:38] [Kaede Sasaki (Casual)] What's Phantom? [01:38] [@Nate Detroit (PJs)] of the Opera. [01:39] [Kaede Sasaki (Casual)] Ooooh, right. [01:43] [@Nate Detroit (PJs)] Nice little country. Pity they had to tighten security after the attacks. We used to make lots of trips to South Detroit. [01:43] [@Nate Detroit (PJs)] Nor I, but I love a good musical. [01:47] > @Nate Detroit (PJs) yawns and shudders. [01:49] [@Nate Detroit (PJs)] Yeah.. putting the cat to bed took more out of me than I expected.. Man.. seems like I'm always running on E with you two. [01:51] [@Nate Detroit (PJs)] I really should turn in. I promise I'll make it up to you both soon. [01:52] [+Kalli (Jumpsuit)] Yeah, we understand. [01:52] > @Nate Detroit (PJs) turns Kalli and kisses her. [01:52] > +Kalli (Jumpsuit) gives Nate a kiss and slides off his lap. [01:52] > @Nate Detroit (PJs) stands and leans over to kiss Kaede. [01:54] [@Nate Detroit (PJs)] Thanks for making me feel better. Love you both. [15:25] [Sskt (human)] who do they think they are anyway! [15:32] [Aaron Abernathy (Casual)] Ya' know.... ya' look good... but ya' look SO much better without that disguise. [15:33] [Aaron Abernathy (Casual)] I miss you anytime I'm not around you, deary. [15:34] > Aaron Abernathy (Casual) gives Sskt a quick kiss and smiles / Ya' sounded a bit upset before I hugged ya'. Somethin' wrong? [15:39] [Aaron Abernathy (Casual)] Well, the normal humans 'ave yet to discover life on other planets. [15:42] > Aaron Abernathy (Casual) nods / I have ta' use it quite a bit. [15:43] [Sskt (casual)] so what have you been up to while I was gone? [15:45] [Aaron Abernathy (Casual)] I was startin' to get worried. [15:47] [Sskt (casual)] well now I'm back...and you can have fun once again! [15:50] > Sskt (casual) moves up against aaron "you know I kept a photo of us with me on the mission"
[15:50] [Aaron Abernathy (Casual)] Did ya' now? [15:54] [Aaron Abernathy (Casual)] Did ya'.... have any fun while you were gone? [15:58] > Sskt (casual) gives a happy sigh "I....wanted to remain faithful to you"
[19:22] [~Solarchos OOC] I'd originally had an event planned for tonight, but given how crazy things have been for me I haven't had any chance to do any background set-up work for it. [20:26] > ~The odd girl has returned. She's continuing to wander around the ship. [20:27] [+David O'Cain (casual)] Eh? Who's there? [20:29] > ~The odd girl walks into the room. She's somewhat short and wears a grey raincloak that covers her entire body. [20:30] [Miara] Who are you looking for? [20:30] [~The odd girl] AH-HA!!! I'VE FINALLY FOUND SOME PEOPLE! [20:31] [~The odd girl] What is up with this place, anyway? You're the first living things I've come across in DAYS! [20:31] [Miara] It's big, and people come and go. [20:31] [~The odd girl] So who are you? [20:32] [+David O'Cain (casual)] I'm David. What's yours, kid? [20:33] [~The odd girl] As for who I'm looking for...I'm looking for someone extremely important and precious to me. And I've been waiting to search for him for over nine years. [20:33] > ~The odd girl throws off the raincape and tosses it onto a nearby rack. [20:34] [Miara] So who are you looking for? [20:36] [Marisa Kirisame] I doubt you know him. The Onryo. The Killer Angel. His name is Langister...and I've been waiting for the chance to find him for a long, long time. [20:37] [+David O'Cain (casual)] Why are you looking for him? [20:37] [Miara] Sure. Who doesn't? [20:38] [Marisa Kirisame] And who am I? Hmmm, I doubt you two have ever heard of a place called Gensokyo. [20:39] [+David O'Cain (casual)] Actually, I have. Through others who've come here. [20:40] [Miara] Really? Cause he's married with 4 kids. [20:41] [Miara] Yeah...good luck with that. [20:42] [+David O'Cain (casual)] Whatever plans you got for him, scrap'em. He's not gonna be with you. [20:43] [Marisa Kirisame] So who are you guys? And why does she look like she's been rolling around in the dirt? [20:43] [Miara] And apparently I fell asleep before I got to the shower..
[20:44] > Marisa Kirisame looks around the room, sees what looks like a solar-powered calculator lying on a side table, and sticks it into one of her pockets. "Oooo! I think I'll take this!" [20:44] [+David O'Cain (casual)] Put that back! [20:44] [Marisa Kirisame] And whadya mean he's not gonna be with me? Impossible! [20:44] [Marisa Kirisame] Wait, what? [20:45] [Marisa Kirisame] What's a tornado? [20:45] [Marisa Kirisame] So, does this little trinket belong to someone? If it does and they need it I'll give it back to them later. [20:46] [+David O'Cain (casual)] You'll put it back now. [20:46] [+David O'Cain (casual)] It belongs to this ship and its crew. [20:46] [Marisa Kirisame] Is it yours? [20:48] [@HOL_6000] Welcome aboard, Daniel J. [20:49] ➣ Daniel J appears to be a guest. [20:49] [Marisa Kirisame] Ooo, a new person! [20:49] [+David O'Cain (casual)] Find you? How the hell would they be able to do that, pray tell? [20:50] [Daniel J.] Isn't that place supposed to be closed off? [20:50] [Daniel J.] Or something? [20:50] [Marisa Kirisame] How ya doing, new person? Who are you? [20:51] [Marisa Kirisame] Welllll, it supposedly is, but that's not stopping me! [20:52] [Daniel J.] I'm Daniel. [20:53] [Marisa Kirisame] Oooo, so what kind of interesting stories and things have you seen Daniel? I'm obviously new here. I'm still trying to understand this place. [20:54] [Marisa Kirisame] For starters, what's going on in Japan nowadays? I keep hearing all about radiation and stuff. [20:55] [+David O'Cain (casual)] Oh yeah, the earthquake. That caused some serious damage to a power plant. [20:55] > Marisa Kirisame remains unaware that her pocket has been telekinetically picked. THE SNEAK-THIEF HAS HERSELF BEEN SNEAK-ROBBED!!! [20:55] [Daniel J.] I think it was an earthquake, I'm not sure. [20:56] > Marisa Kirisame looks at Daniel J. [20:56] ➣ Daniel J.: A man with short brown hair and blue eyes. He stands at average height and is clearly fit. [20:57] [Marisa Kirisame] Whoa, are you sure some girls from Gensokyo weren't visiting Japan right around the same time? [20:58] [Marisa Kirisame] Like...uh...a certain Hellraven with a penchant for radiation? [20:58] [Daniel J.] Sorry, but I have no idea what you're talking about. [20:59] [+David O'Cain (casual)] Never saw her over at the nuclear reactors. The only time I'd seen her was rescuing Solar some time ago. [20:59] [Marisa Kirisame] YOU SAW SOLAR?! WHERE!!! [21:00] > Marisa Kirisame flashes everyone a dazzling smile. She's quite, quite excited. [21:01] [+David O'Cain (casual)] Way back in March. That girl you described? She was clawing at a set of doors, and I'm pretty sure Solar didn't want her near him. [21:01] [Daniel J.] Oh, I see. I do seem to remember there was a "Cult of Solar" of sorts. [21:02] [Marisa Kirisame] I still don't know why that stupid bird-brained b[SMEG]ch is even still TRYING. She's an idiot, she's a dumbass, and she's got the WORST hair. [21:04] [Marisa Kirisame] At least I've got an education. And a vocabulary. [21:05] [Marisa Kirisame] Ooooo, so what's on tap tonight? [21:06] [Daniel J.] There's a whole bar right here? [21:06] [Marisa Kirisame] ALL RIGHT!!! [21:06] [+David O'Cain (casual)] Anyway, a couple friends and I were able to get Solar and the kits out of Gensokyo. [21:06] > Marisa Kirisame goes over to the bar and helps herself. [21:07] > Marisa Kirisame jerks a little as she hears the Kits being mentioned, freezing for a second or so. [21:08] [Marisa Kirisame] So, uh, how are those little fox-children anyway? [21:09] [+David O'Cain (casual)] They're doing just fine. Being silly kids as usual. [21:10] [Marisa Kirisame] ...I've actually seen them. They...they look just like him. They all do in little ways. [21:10] [Daniel J.] How old are they now? Still little? [21:11] [+David O'Cain (casual)] Let's see. The oldest are 4, while the youngest are 3 if memory serves right. [21:12] > Marisa Kirisame browtwitches. [21:13] [Marisa Kirisame] I'm sure my Solarchos is a good father. [21:14] [+David O'Cain (casual)] Of course, with Inu-Kit being a good mother to the little rascals. [21:15] > Marisa Kirisame takes a big sip of a Sappuro...and spits it out violently when she hears the word "Inu-Kit". [21:16] [Daniel J.] Uhoh..gotta go. I wasn't here! [21:16] [+David O'Cain (casual)] Er, you alright? [21:17] [Marisa Kirisame] THAT DAMN KITSUNE-ONNA!!! Everyone knows they can't be trusted!! [21:18] [Marisa Kirisame] Foxwomen are all nasty, nefarious tricksters! NONE OF THEM CAN BE TRUSTED! NOT ONE! [21:18] [+David O'Cain (casual)] Are you REALLY sure about that? [21:19] [Marisa Kirisame] HELL YES! I've known plenty of fox-women, and not ONE of them is honest, trustworthy, or even smart! They're ALL harlots who use their powers to seduce men's minds and enslave them!!! [21:20] > Ran Yakumo is NOT amused. [21:20] > Ran Yakumo is also holding a crowbar and is approaching Marisa from behind. [21:21] [+David O'Cain (casual)] I don't know about that. I've heard they're quite loyal to ones they love. PLUS, Inu-Kit is a rather nice woman of all the times I've been around her. Maybe she's only mean towards YOU. [21:22] [Marisa Kirisame] I've...never...actually met her. BUT I KNOW HER TYPE!!! [21:22] [Miara (dress)] If you've never met her, that can't possibly be true. [21:22] [+David O'Cain (casual)] Riiiight. [21:23] [Marisa Kirisame] Hardly! Foxwomen are all alike. They use those tails of theirs to seduce men and enslave them! [21:24] [Miara (dress)] I've never heard that, and I've met a few. [21:27] [+David O'Cain (casual)] Well, I'm sure you'll see for yourself soon enough. [21:28] > Marisa Kirisame grumbles and crosses her arms. [21:29] [Miara (dress)] So Dave, have I missed anything recently? [21:29] [Marisa Kirisame] Well, I'll get my man in the end. I've been waiting so long for this opportunity and I'm NOT going to lose! [21:31] [+David O'Cain (casual)] Not much, Miara. Other than her trying to walk off with a calculator lying around. [21:31] > Ran Yakumo WHACKS Marisa across the head from behind, sending her hat flying across the room and sending the thieving-witch face-first into the floor. [21:32] [Miara (dress)] Oh. For the last week? [21:32] [+David O'Cain (casual)] For the last week? That was just tonight. As for the week, not a whole lot really. [21:32] [+David O'Cain (casual)] Nice hit, man. [21:35] [Ran Yakumo] She was insulting foxwomen! I *had* to do something! [21:35] [+David O'Cain (casual)] I don't know where she got the idea. [21:36] [Ran Yakumo] We kitsune-onna don't take such defamation lying down! [21:37] [+David O'Cain (casual)] What? [21:37] [Ran Yakumo] Marisa's just insanely jealous that Solarchos got married to a foxwoman. She's...determined. [21:39] [+David O'Cain (casual)] I see. Anything I can do to fix that? Perhaps remove her soul, or have a friend mess her mind up...? [21:39] [Miara (dress)] Meh. Training. [21:40] [Ran Yakumo] Oh, who am I kidding. Marisa's still obsessed with the guy. She's *never* stopped caring about him, but this is the first time in nine years that she's had a chance to actually DO something about it. [21:41] [Ran Yakumo] Mess her mind up? Good luck with that. Her magical abilities are so powerful that I doubt she'd be affected. [21:41] [+David O'Cain (casual)] Just a suggestion. [21:42] > Grim suddenly appears behind David, "Doubtful simply taking out her soul will do much either." [21:43] [+David O'Cain (casual)] Come on. Not even a teensy threat? [21:43] [Grim] Eh, that kid doesn't look that easily intimidated. [21:43] [Ran Yakumo] For nine years we all thought there was no way for the Onryo to *ever* return to Gensokyo. Throughout that time Marisa more or less acted normal. Then over the last year things changed. [21:44] > Marisa Kirisame is still very much out of it, and mumbling to herself. She's apparently having a reeeeeeally hot dream. "Yes...yes...again...!" [21:45] [Grim] That knock to the head must have jarred her brain loose or something. [21:46] > +David O'Cain (casual) just looks at Marisa uneasily, "Yeah...maybe." [21:47] [Ran Yakumo] And you know what the weird thing is? Solarchos and Marisa *hated* each other when they first met. [21:48] [+David O'Cain (casual)] Seriously? [21:48] > Ran Yakumo nods. "You're surprised?" [21:50] [+David O'Cain (casual)] A little bit. [21:51] [Ran Yakumo] Well, it's a bit of a strange story. As you probably know for yourself, Solarchos is rather orderly and organized. Smart, disciplined, uses forethought, as befitting his military background. [21:51] > +Matsumi Kaze (casual) walks in "hi guys"
[21:52] > Ran Yakumo flicks all nine of her tails in greeting. [21:52] [+David O'Cain (casual)] Hi, Matsumi. [21:53] [Ran Yakumo] Marisa is quite different. In fact, she and the Onryo are almost exact opposites of one another. [21:54] [Grim] Well, they say opposites attract one another. They must have been into all sorts of arguments. [21:55] [Ran Yakumo] Like you wouldn't believe. In fact, she seemed to hate him at first. They had some huge fights too. [21:56] [Ran Yakumo] Marisa is the opposite of Solarchos. She's full of boundless enthusiasm, rarely ever gets depressed or upset, and she never seems to take anything particularly seriously. [21:57] [Grim] I see, I see. [21:57] [Grim] Well, I just stopped by for a quick chat. Be seeing you. [21:57] [Ran Yakumo] Life's a gigantic adventure for her. The future is something for someone else to worry about later on: she's all for the "here and now". [21:57] > Ran Yakumo waves goodbye to Grim. [21:58] [Ran Yakumo] Take care, grim reaper. [21:58] [+David O'Cain (casual)] Familiar with Grim, huh? [22:00] [+David O'Cain (casual)] I see. [22:00] [+David O'Cain (casual)] Unfortunately for me, I really need to get going. You ladies take care. [22:01] [Ran Yakumo] Very well. Good evening to you. [22:02] [Ran Yakumo] Are you all right, miss? [22:05] [Miara (torn dress)] She's still out? [22:05] > Ran Yakumo looks at Miara curiously. "What happened to your dress? [22:05] [Miara (torn dress)] Training. I didn't have time to change. [22:06] [Ran Yakumo] And yes, she's still quite unconscious. [22:07] > Ran Yakumo thought that Miara was wearing a very nice outfit. It's too bad it's torn. [22:09] [Miara (torn dress)] Vana's back, then? [22:10] [Miara (torn dress)] Oh, people believe all kinds of things when they want to. [22:11] [Ran Yakumo] But still! [22:12] [Miara (torn dress)] But still what? [22:12] [Miara (torn dress)] I'm happy for you then, Mats. [22:13] [Ran Yakumo] Oh? Who is this Vana person? [22:13] [Ran Yakumo] Ahhhh. It's good that she's back then. I can tell you missed her. [22:17] [Ran Yakumo] Miss Miara, you mentioned you were training. What kind of training were you engaged in? [22:19] [Miara (torn dress)] Combat. [22:20] [+Matsumi Kaze (casual)] why do you constantly train? [22:20] [Ran Yakumo] Ahhh. There's plenty of that back home. For us it's all magic-based though. Yours seems to be physical. [22:21] [Miara (torn dress)] Cause if you stop you start loosing it? Surely you train, Mats, since you're still a senshi. [22:21] [Miara (torn dress)] I've got both, Ran. [22:22] [Miara (torn dress)] You're not even showing, of course you can. Just make sure you eat. [22:23] [Miara (torn dress)] You're four months already?? [22:23] > Ran Yakumo nods. "We generally limit ourselves to engaging in magical duels instead of physical fights in order to prevent any conflicts from becoming too deadly." [22:25] [Miara (torn dress)] That's three. [22:25] [Miara (torn dress)] Maybe it was closer to January. 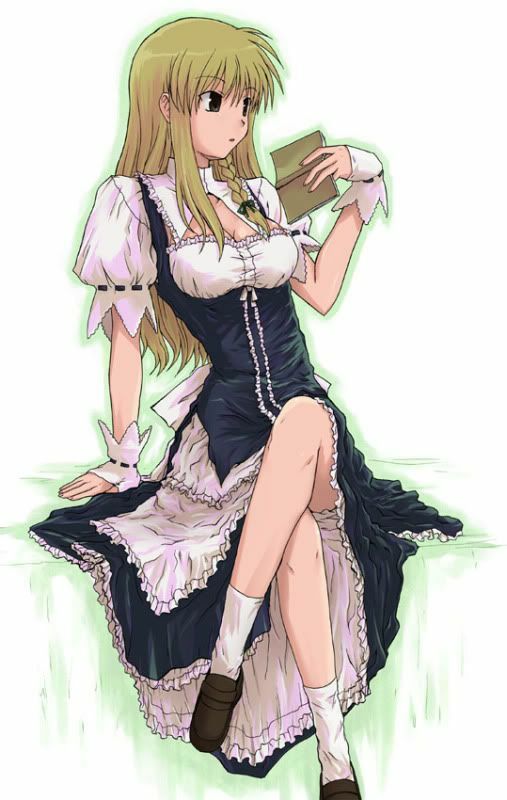 [22:27] > Marisa Kirisame groans and sits up. [22:27] [Miara (torn dress)] Still, you should be able to practice until you're big, and then you can do lighter versions. Or at least, that's what we do. [22:33] > Marisa Kirisame staggers out the door, still very much dazed. [22:43] [+Matsumi Kaze (casual)] welcome back! [22:44] [Miara] Wondering what to do tonight. [22:46] [+Matsumi Kaze (casual)] hm??? [22:48] [Miara] Something fun would be nice after all that. [22:49] [+Matsumi Kaze (casual)] heh any ideas? [22:50] [Miara] Not right yet, but it'll come. [22:50] [Miara] That, or something will present itself. [22:58] [Miara] She's pregnant, you know, that's probably not good for her. [22:59] > Kadran (future) pulls out the dart "Suffisia seed extract......it's harmless to pregnant women"
[23:00] [Miara] Ooh. That's nice. [23:00] [Miara] I don't have very many of them anymore. [23:01] [Miara] Not for at least a few hours. [23:04] > Kadran (future) gets up close to miara and smiles "so....how's it going"
[23:04] [Miara] Alright, I guess. A lot of rescue work. [23:09] [Miara] If you can help, you should, right? [23:12] [Miara] So, what have you been up to? [23:13] [Miara] Besides making sleeping potions? [23:19] > Kadran (future) gets nose to nose with Miara "do I look like normal people to you?" [23:19] [Miara] What's that got to do with it? [23:20] [Miara] That's cause you don't try. [23:20] [Miara] You like being so different. [23:21] > Kadran (future) grins "and is that a problem?" [23:25] [Miara] Any new weapons? [23:26] [Miara] Or should we just go find something fun do to? I was thinking maybe London. [23:32] [Miara] A costume club would be very nice, then. [23:35] [Kadran (future)] now what kind of costumes are we talking about? [23:35] [Miara] Where you can go as is, of course. [23:39] [+Matsumi Kaze (casual)] huh..what? [00:11] > Akihiko Kaioh (Towel) has one towel around his waist and one over his shoulder. [00:11] [Akihiko Kaioh (Towel)] Heey Sagi bro, how are ya? [00:11] [Sagiri Shin (casual)] but do you really have to do it...IN MY ROOM!? [00:12] [Akihiko Kaioh (Towel)] Oh... was that where that was? ^^ We were a little drunk. Whats the big deal though, you have maids. [00:13] > Sagiri Shin (casual) starts walking towards Akihiko "and a man's room is his private sactum"
[00:17] > Akihiko Kaioh (Towel) walks behind Sagi and rubbs his shoulders. [00:21] [Akihiko Kaioh (Towel)] Whyyyyyyyyyy do you find the worst in EVERYTHING! I'm the second born and I'm happy. Nobody is going to pawn you off? What do you even mean, 'pawn you off'? Besides, if you want a greater role, make one for you. I do some political work, but I found my passion in modeling. [00:23] > Akihiko Kaioh (Towel) lets go of him and goes to the bar, producing asprin and water. [00:23] [Akihiko Kaioh (Towel)] You're takign that stupid-powerful brain of yours and using it to read waaaaay too much into an affectionate nickname. [00:24] [Akihiko Kaioh (Towel)] I didn't, I called it stupid-powerful. [00:24] [Akihiko Kaioh (Towel)] ...dude? [00:26] > Akihiko Kaioh (Towel) brings him the water and asprin. [00:26] [Akihiko Kaioh (Towel)] Take these bro. [00:26] [Akihiko Kaioh (Towel)] ...or maybe we need to get you to a meta-doctor? [00:28] > Akihiko Kaioh (Towel) turns him over and shakes him. [00:28] [Akihiko Kaioh (Towel)] Mats? Thank heavens.. Something's wrong with Sagi. [00:29] [Akihiko Kaioh (Towel)] He said his head felt like it was on fire. [00:30] > Akihiko Kaioh (Towel) backs up, still looking worried. [00:32] [Matsuo Shin (future)] you know about my powers, right? [00:33] [Akihiko Kaioh (Towel)] A little. [00:36] > Akihiko Kaioh (Towel) covers his mouth as his eyes widen further still and his towel slips a little further down his waist. [00:38] [Akihiko Kaioh (Towel)] But... your powers don't cause you pain, do they? [00:39] [Akihiko Kaioh (Towel)] Oh.. I see. [00:40] [Akihiko Kaioh (Towel)] Poor Sagi.. Thats awful..
[00:43] [Akihiko Kaioh (Towel)] Yeah.. but you have to do what you have to do, I guess.. Is he improving? [00:45] [Akihiko Kaioh (Towel)] Two powerful brains at work in his pedigree. Ami's super-intelligence and your psychic powers..
[00:50] [Akihiko Kaioh (Towel)] Pity.. I just wanna see him happy and loved.. Will do, later Uncle Mats. [00:52] [Akihiko Kaioh (Towel)] I don't think you wanna know. [00:52] [Sagiri Shin (casual)] um alright.....what was I talking about before? [00:53] [Akihiko Kaioh (Towel)] How much you resent my constant attempts to make you happy. Ohh, and you we're misunderstanding something I said about you brain. [00:54] [Akihiko Kaioh (Towel)] Wanna talk about it? [00:55] [Akihiko Kaioh (Towel)] No idea why? [00:56] [Akihiko Kaioh (Towel)] Maybe she's pregnant? [00:57] [Sagiri Shin (casual)] wha..what!? [00:57] [Akihiko Kaioh (Towel)] Well, she did say she wanted to have ten of your babies. [01:03] > Sagiri Shin (casual) shakes his head "well I'd hope not XD"
[01:05] [Katsumi Kaioh (casual)] SAGI! [01:05] > Akihiko Kaioh (Towel) chuckles. [01:07] [Akihiko Kaioh (Towel)] Huh? What, am I a child? [01:10] [Katsumi Kaioh (casual)] oh Aki! have you seen what the newspapers from my world are saying!? [01:10] [Akihiko Kaioh (Towel)] Can't say I have. [01:13] > Akihiko Kaioh (Towel) examines it with both hands, causing the towel to fall dangerously low. [01:15] > Katsumi Kaioh (casual) has handed Aki a magizine..the cover shows a blurry photo of sagiri and katsumi hand in hand with the words "PRINCESS SEEN WITH PRINCE OF MERCURY...MATRIMONY RUMORED SOON!" [01:15] > Akihiko Kaioh (Towel) chuckles, then bursts with laughter. [01:18] [Yuki Shin (Kimono)] What's so funny? [01:18] > Akihiko Kaioh (Towel) holds out the magazine for Yuki to read. [01:18] [Akihiko Kaioh (Towel)] Not that it isn't a good idea. [01:20] > Akihiko Kaioh (Towel) tosses the magazine aside and embraces Yuki, kissing her. [01:20] > Sagiri Shin (casual) holds katsumi "...I wish I could remember what happened eailer..."
[01:21] [Yuki Shin (Kimono)] Hmm? Something wrong? [01:23] [Akihiko Kaioh (Towel)] Blindsight is always 50:50. [01:25] [Akihiko Kaioh (Towel)] I don't think he was there, dear. Besides, it wouldn't be -that- big a deal, would it? [01:27] > Akihiko Kaioh (Towel) grits his teeth, barely able to suppress his laughter. [01:28] [Akihiko Kaioh (Towel)] Honey, there's nothing plain about me. [01:29] > Akihiko Kaioh (Towel) poses with his arms behind his head. [01:30] > Yuki Shin (Kimono) rushes up to Kat, fire in her green eyes. [01:31] [Akihiko Kaioh (Towel)] Well... if you ladies wanted a... civil.. way of solving this.. there's usually a few swimsuit and hot body contests on the beaches in the summer outside the capital city. [01:33] [Yuki Shin (Kimono)] Pompous brat! [01:34] > Akihiko Kaioh (Towel) scoots away from them, to Sagiri's side, looking concerned. [01:34] [Katsumi Kaioh (casual)] unintellagble wrech! [01:37] > Akihiko Kaioh (Towel) blushes a little at that. [01:38] [Yuki Shin (Kimono)] You little lying brat! Who spent the whole test copying off MY paper, hmm? [01:38] [Katsumi Kaioh (casual)] and you still only managed to pass with a 60%....did you ever tell your dear mommy that??? [01:39] [Sagiri Shin (casual)] only 60%! ?....you said you got 90! [01:41] [Akihiko Kaioh (Towel)] Whatever that means..
[01:42] [Akihiko Kaioh (Towel)] Girls, please... lets all calm down. [01:43] > Yuki Shin (Kimono) just breaks down, crying. [01:43] > Akihiko Kaioh (Towel) glares at Kat, then Sagiri, as if to say he should control her, then makes to hug Yuki. [01:45] [Sagiri Shin (casual)] kat? [01:45] > Yuki Shin (Kimono) cringes a little at Sagi's outburst too. [01:46] [Sagiri Shin (casual)] ...oh man what did I do? [01:47] [Akihiko Kaioh (Towel)] shh shh... its okay, love. [01:47] [Sagiri Shin (casual)] gah..kat...kat??? [01:47] > Yuki Shin (Kimono) is shocked out of her crying, staring at Kat. [01:48] > Akihiko Kaioh (Towel) looks as well. [01:48] [Akihiko Kaioh (Towel)] Well, at least you shut her up, whatever you did. [01:48] [Yuki Shin (Kimono)] What? What? What?! [01:49] [Akihiko Kaioh (Towel)] How is she standing?? [01:50] > Katsumi Kaioh (casual) blinks "and another thing!" [01:50] [Sagiri Shin (casual)] huh..kat? [01:50] > Yuki Shin (Kimono) jumps as Kat is snapped out of it. [01:52] > Akihiko Kaioh (Towel) smiles at them, then Yuki, as he wipes the tears from her cheek. [01:54] > Yuki Shin (Kimono) rubs her forehead, trying to smile back. [01:55] [Akihiko Kaioh (Towel)] Going to be alright, love? [01:56] [Yuki Shin (Kimono)] Dad told me I might get a bit of a shock if and when Sagi starts learning to use his powers. [01:58] [Sagiri Shin (casual)] what powers??? [02:00] [Akihiko Kaioh (Towel)] Such an... odd... family..
[02:01] [Sagiri Shin (casual)] what's odd about us, aki? [02:01] [Akihiko Kaioh (Towel)] Crazy brainpower and psychic powers and your parents apparently watch everything that happens in your heads. [02:09] [Akihiko Kaioh (Towel)] Glad my parents can't do that.. I dare say, they get enough information from the maids. [02:13] [Akihiko Kaioh (Towel)] Mm... we're joined by another beautiful woman. [02:13] > Celestite Detroit (Nightgown) walks in and pauses, blushing as she sees Aki, "Well hello Aki..... Yuki, Sagi"
[02:14] > Akihiko Kaioh (Towel) makes a show of resecuring his towel. [02:14] [Yuki Shin (Kimono)] Hi, Cele-san. [02:14] [Celestite Detroit (Nightgown)] Heh, how's everyone tonight? [02:15] [Akihiko Kaioh (Towel)] A little rocky, but nothing love cannot overcome. Yourself? I hear your family is expecting. [02:15] [Yuki Shin (Kimono)] Oh yeah! How is Tina? [02:16] [Celestite Detroit (Nightgown)] I'm ok, Tina's doing well, resting. [02:16] [Celestite Detroit (Nightgown)] What fireworks? [02:16] > Yuki Shin (Kimono) gives a little glare in Kat's direction, trying not to be obvious. [02:18] [Yuki Shin (Kimono)] Uhh.. Ask dad, I guess. I don't really get it either. [02:19] > Yuki Shin (Kimono) holds her head. [02:20] [Sagiri Shin (casual)] sister??? [02:20] [Akihiko Kaioh (Towel)] o_O Yuki? Hell,s what now? [02:21] > Celestite Detroit (Nightgown) walks over, giving Aki a good once over, "I have no idea what's going on.... but there's one thing I gotta' say....."
[02:21] [Yuki Shin (Kimono)] Feels like dad's downloading a novel into my head. [02:22] [Yuki Shin (Kimono)] Moh.. He knows I'm no good at that stuff..
[02:23] [Akihiko Kaioh (Towel)] Pity for you you turned down your chance when you had it. Now you have to take it up with my Yuki. [02:24] > Celestite Detroit (Nightgown) smirks, "It's alright. Marty really is all the man I need." [02:25] [Celestite Detroit (Nightgown)] From what Tina told me, Aki is quite more then adiquite. [02:25] > Akihiko Kaioh (Towel) chuckles and rolls his eyes. [02:26] [Katsumi Kaioh (casual)] oh and he's jumped her as well? [02:27] [Akihiko Kaioh (Towel)] Apparently nobody pays much attention to my modeling.. I'm surprised my endowment is only ever whispered about in royal circles..
[02:28] [Katsumi Kaioh (casual)] my poor lost cousins! [02:29] [Celestite Detroit (Nightgown)] What're you talking about over there, Katsumi? [02:30] [Akihiko Kaioh (Towel)] Yeah, I'm confused. [02:31] [Akihiko Kaioh (Towel)] Ya know, I'm gettin real tired of everyone hating on us..
[02:32] [Katsumi Kaioh (casual)] it was simply a jest, dear girl....and..
[02:32] [Sagiri Shin (casual)] !!! [02:35] [Akihiko Kaioh (Towel)] Then you should learn to be nicer. [02:36] [Yuki Shin (Kimono)] Hai! [02:37] [Akihiko Kaioh (Towel)] See you tomorrow. [02:39] [Celestite Detroit (Nightgown)] Awww, don't worry Sagi.... I'm sure you'll see Kat again soon enough. [02:40] [Akihiko Kaioh (Towel)] Sometimes I wonder if you could do better, Soggy. [02:41] [Akihiko Kaioh (Towel)] Katsumi would be NOTHING if not for that attitude of hers..
[02:43] [Akihiko Kaioh (Towel)] Doesn't take much. 9_9 He'll get over it. [02:45] > Celestite Detroit (Nightgown) sighs and shrugs, "Oh well.... how're you two tonight?" [02:46] [Akihiko Kaioh (Towel)] Confused and overwhelmed by aristocratic drama, and a little tired. [02:47] [Akihiko Kaioh (Towel)] Yeah, its been an exhausting night.. You going home, love? [02:47] [Celestite Detroit (Nightgown)] Well then, if you two are that tired, allow me to walk with you to the transporter. [02:48] [Yuki Shin (Kimono)] Unless you don't mind carrying me home when you're done talking to Cele-san. [02:49] [Akihiko Kaioh (Towel)] No, I should get my beauty sleep too. [02:49] [Akihiko Kaioh (Towel)] Lets go, and I'll see you home. [02:50] > Akihiko Kaioh (Towel) guides Yuki out. [12:41] [@HOL_6000] Anubis Saotome (casual) reporting for duty. [12:42] [Anubis Saotome (casual)] Mother, are you ok!? [12:43] [Anubis Saotome (casual)] Oh no...... you must have been caught up with Rimmer. [12:45] [Anubis Saotome (casual)] Yes, that is definitely Rimmer. [12:46] [Anubis Saotome (casual)] Can I get anything for you, mother? [12:49] > Anubis Saotome (casual) sighs and then suddenly looks angry, standing. [12:50] [Masumi Saotome] wh..what is it, son? [12:56] > Masumi Saotome runs over and tries to stop her son "son! I cannot bear the thought of you turning to this!" [12:57] > Anubis Saotome (casual) stops and looks back at his mother - How can you be so forgiving of someone like him? [13:02] > Anubis Saotome (casual) sighs and calms himself - I do not understand how you can just let something like this stand...... but alright. [13:03] > Masumi Saotome smiles "I'm glad...."
[13:06] > Anubis Saotome (casual) turns towards Masumi and sighs - I am sorry.... I just cannot stomach the idea of you being hurt, physically or mentally. [13:08] > Anubis Saotome (casual) smiles a little down to Masumi. [13:09] [Anubis Saotome (casual)] Just please do me a favor..... do not allow Rimmer to trick you into anymore games. [13:10] [Anubis Saotome (casual)] I have heard that he is so useless that not a single person on this ship is beneath him. [13:12] [Anubis Saotome (casual)] I highly doubt that. [13:17] [Masumi Saotome] how is your day going? [13:18] [Masumi Saotome] would you mind helping me today? [13:20] [Anubis Saotome (casual)] Sure, what do you need? [13:24] [Anubis Saotome (casual)] Alright then. I have some free time if you will show me what needs to be moved. [13:28] > Anubis Saotome (casual) holds his automail arm to Masumi - Shall we, mother? [13:31] > Masumi Saotome takes anubis's arm "let's, son ^^"
[19:50] > Chibi-Catri and her brother quickly scamper into the room, plop themselves down on the top of the blanket pile, and eagerly get to work on playing with some crayons and coloring books. [20:08] > Chibi-AnTil looks around the room, his ears flicking a little. [20:15] [+David O'Cain (casual)] Well, nice to see you two. [20:17] [+David O'Cain (casual)] How're you doing? [20:19] [+David O'Cain (casual)] I'm not sure where he is, Catri. I hadn't seen him since last week. [20:22] > Chibi-Catri looks sad now. [20:22] > Chibi-AnTil drew a picture of what looks like several girls standing side by side on top of what looks like a big hill (or maybe a mountain). [20:23] [+David O'Cain (casual)] Say, where's that from, Antil? [20:26] [+David O'Cain (casual)] I see that. Do you know where the mountain is? [20:30] [+David O'Cain (casual)] Special place with lots of friends. That could be anywhere. [20:33] [+David O'Cain (casual)] Oh. You mean Gensokyo? [20:34] > Chibi-AnTil nod-nods, giggling. [20:39] > Chibi-Catri pounces at David and grapples with his ankle! [20:51] > Chibi-Catri trills happily and grabs hold of David's hand, huggling in and giving him tail-pats. [20:51] [+David O'Cain (casual)] Awwww. [20:53] [Chibi-AnTil] Ya. Where Dada now? [20:54] [+David O'Cain (casual)] I don't know. He was here when I saw him last week. I haven't seen him since. [20:55] > Chibi-Catri and Chibi-AnTil are suddenly engulfed from behind by thick, fluffy fox-tails. Nine of them, to be exact!